This high-precision technology allows tracking the riding time of each participant. The timing chip will be a new feature for the Rosarito-Ensenada Bike Ride and every participant will be able to obtain an official time record. This information will be available as soon as you finish the ride. Each participant must register their chip and personal data before May 1st, 2013. Your time record will appear with name, age, team, etc. It is the newest tracking system: Bib-Tag. A high precision chip, decoders and modular mats are used to register data. This system is approved by the IAAF and it is optimized for each sport event. This chip is disposable and will be attached to each participant’s number. Mats are placed in both the Start Line and the Finish Line. The timing chip sends a signal when the cyclists passes through the mats, a decoder verifies that signal and it is processed through a data base. 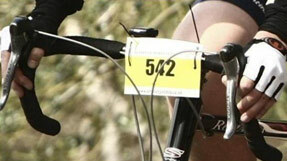 Your participant number must be placed in the front of your bicycle using straps. The timing chip must not make contact with the bicycle frame or any other metal object. You must line up at the finish line so that your chip is activated when you go pass it and your time is tracked appropriately. You must get across the finish line in order for your time to be tracked correctly. mportant notice: The omission of these guidelines will risk the correct time tracking of the participant.